The ‘MUD AND WAR RUN’ encourages our participants, called 'Muddy Grunts', to maneuver through 5Ks of mud, obstacles and special scenes depicting famous battles. Mud Runs or Obstacle Runs are primarily based on the military boot camp experience, yet none of them delve into the real reason troops go through that boot camp experience in the first place. Those troops are training for war. A ‘MUD AND WAR RUN’ event gives Muddy Grunts a glimpse of what our troops have been through in boot camp, but also insight into what they have been through on the battlefield. As a Muddy Grunt you will go through mud pits, navigate obstacles and move through scenes recreating battles such as D’Day, Iwo Jima, or Gettysburg. These battle scenes will be intense, exciting and unlike anything most of you have been through before. The event is not timed and is aimed to encourage all Muddy Grunts to help each other whenever and wherever needed. No one gets left behind. Please Note: we are not war mongers or lovers of war. We fully appreciate and respect those who have gone before us to fight for the freedoms we enjoy. We hope when ‘MUD AND WAR RUN’ participants experience just a hint of what our veterans have gone through, they will gain a greater appreciation for our veterans and understand a little bit more about the real experiences they have endured. Thank you veterans for fighting to maintain the freedom we have and thank you for allowing us the privilege to enjoy an event such as this MUD AND WAR RUN. Muddy: To be covered in mud. Grunt: The soldier or troop doing the hard work or the frontline work – doing the down and dirty work when waging war – an infantryman. 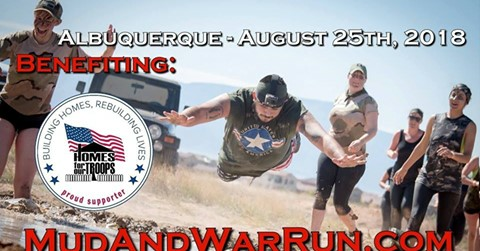 Muddy Grunts: A fun name we label you during this event in honor of those who have been Grunts in real theaters of war. Join us for a day of fun, friendship and MUD!!!!!!!!!! Register now for early bird pricing. Tickets can be purchased here: Get your Tickets Now!